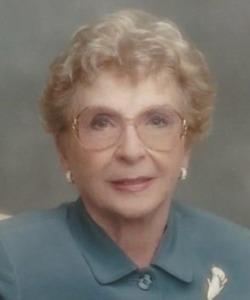 Rhoda Marie (Buse) Pengelly, age 96, passed away, Sunday, March 31, 2019, at American Grand Assisted Living in Neenah. She was born on January 19, 1923, to Emil and Esther (Rusch) Buse in Clark County, Wisconsin and educated at Wisconsin universities. Rhoda taught elementary schools for 27 years and was Rossman School Principal in Hartford for 13 years. Rhoda married Jack Pengelly on December 27, 1943, and had sons Jon and Vaughn. She was active in God’s churches all her life and was a six-year Mesa, Arizona church council member. Rhoda was an avid reader, bridge player, and world traveler. She was appointed to the Wisconsin Council of School Administrators and in 1983-1984 was the state president. On November 3, 2003, the new Rossman Library and IMC were dedicated to her in an elaborate ribbon cutting ceremony, reception, and rose laden dinner. Rhoda is survived by two sons, Jon (Elizabeth) Pengelly, Vaughn (Audrey) Pengelly; grandchildren, Michelle (Adam) Breunig, and Heather (Alex) Zagrodnick; two great-grandchildren, Grant and Claire Breunig; stepchildren, Kerry Vissers (special friend, Sue), Tammy (Mike) Woodke, Tina (John) Peterson, and Beth (Rick) Lyons; seven step-grandchildren; three step-great-grandchildren; a sister, Audrey Sautner; a brother, Wilbur Buse; and other relatives and friends. Preceding Rhoda is death were her parents; her husband, Jack; three step-great-grandchildren, Marshall, Jamie, and Casey; and two sisters, Isabelle Bruesewitz and Bernice Kuehmichel. A funeral service will be held on Saturday, July 6, 2019, at 5:00 p.m. at St. Mark’s Lutheran Church 140 S. Green Bay Rd. Neenah. There will be no visitation prior to the service. Entombment will be in Wisconsin Memorial Park, Brookfield. Memorials may be given to St. Mark’s Lutheran Church. Your mom was my fifth grade teacher and I just loved her. I am so sorry to hear about her passing. Please accept my condolences to you and your families.